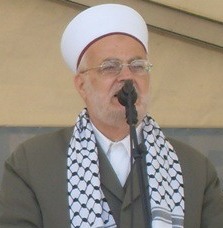 Jerusalem – Ma’an - Head of the Islamic Higher Commission Sheikh Ekrima Sabri was barred from entering the Al-Aqsa Mosque in Jerusalem for six months following an order from Israeli intelligence delivered Thursday. Sabri was called in to the intelligence earlier in the week, and ordered to report to "room 4" in the Russian compound in Jerusalem. The room is notorious for its interrogations of Jerusalemite Palestinians, and the unit that heads the room collect intelligence on those requested to report for questioning. Sabri did not go to the interrogation and was hand delivered an order signed by the commander of the intelligence unit barring him from access to Al-Aqsa. The Sheikh received his orders to report to the intelligence unit immediately upon returning to Jerusalem from Saudi Arabia where he was performing the Hajj pilgrimage on Wednesday, he said.